Wow, what a great month October is! Pro football, fantasy football, college football, hockey, soccer, NBA exhibition games, and the World Series! What a smorgasbord of athletic entertainment! But where do the results of all that blood, sweat, and tears fit in the eternal scheme of things? Even in the temporal realm, the winners’ fame and fortune are fleeting. And yet, athletics does provide quite an array of very positive principles for successful Christian living. No doubt that is why the Christian Scriptures are replete with sporting metaphors and examples. Personally, I am most grateful that my dear father began throwing a ball to me when I was two years old, and never stopped. My subsequent basketball, baseball, and football endeavors from elementary school through college provided me with many thrilling moments, invaluable life lessons, plenty of opportunities to laugh at myself, and close friendships with guys I never would have otherwise known so well. Some of them I didn’t even like to begin with, but as we competed side-by-side with the same goal we formed a strong bond. 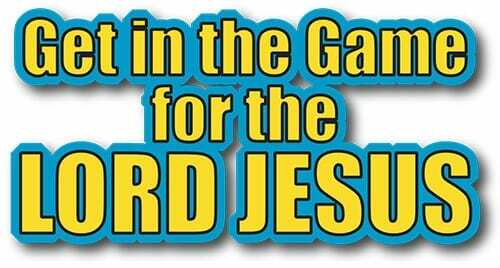 God’s Word makes it clear that if you choose to “step up,” “get in the game,” and “leave it all on the field” for the Lord Jesus, you will be the target of relentless opposition from the Devil. Lately I’ve been thinking about how, under such pressure, we can relish the spiritual competition rather than let it wear us down and burn us out. In short, we can love the fight. It must be available to follow Jesus’ example of increasing trust, joy, peace, commitment, intensity of purpose, and spiritual momentum all the way to the Cross. In athletic terms, that is called, “sprinting to the tape.” As you read this sharing, think about the state of your own spiritual momentum. The Word of God is a gold mine designed to enrich our lives at the deepest level of our hearts. If we put our eyes on the print and prayerfully ponder its words of life, the Lord Jesus will minister to us according to our needs. This, coupled with obedience, is how we build the intimacy with him that is required to energize our own sprint to the tape. In that vein, let us examine a very significant biblical word group that will shed great light on this topic for us. 1 Therefore we also, since we are surrounded by so great a cloud of witnesses, let us lay aside every weight, and the sin which so easily ensnares us, and let us run with endurance the race [agon] that is set before us, 2 looking unto Jesus, the author and finisher of our faith, who for the joy that was set before Him endured the cross, despising the shame, and has sat down at the right hand of the throne of God. And being in agony [agonia—only here], He prayed more earnestly. Then His sweat became like great drops of blood falling down to the ground. It is clear that Paul had tapped into the power of his Lord, which is what energized him through his many travails for the sake of the Gospel. To this end I also labor, striving [agonizomai] according to His working which works in me mightily. In large part, the competition in which we are engaged is about the Adversary trying to shut our mouths so we cannot speak the Word and deliver those who hunger for Truth. In response, we must meet his aggression with aggressive trust and obedience and boldness of speech. But even after we had suffered before and were spitefully treated at Philippi, as you know, we were bold in our God to speak to you the gospel of God in much conflict [agon]. 29For to you it has been granted on behalf of Christ, not only to believe in Him, but also to suffer for His sake, 30 having the same conflict [agon] which you saw in me and now hear is in me. Two uses of our “word of the day” make it clear that fervent prayer is a major way in which we contend for the prize. 24Do you not know that those who run in a race all run, but one receives the prize? Run in such a way that you may obtain it.25 And everyone who competes [agonizomai] for the prize is temperate in all things. Now they do it to obtain a perishable crown, but we for an imperishable crown.26 Therefore I run thus: not with uncertainty. Thus I fight: not as one who beats the air. 27 But I discipline my body and bring it into subjection, lest, when I have preached to others, I myself should become disqualified. Fight [agonizomai] the good fight [agon] of faith, lay hold on eternal life, to which you were also called and have confessed the good confession in the presence of many witnesses. I have fought [agonizomai] the good fight [agon], I have finished the race, I have kept the faith. Can you imagine the victory celebration we are going to have? I know I can’t wait to applaud wildly for you as the Lord places his rewards in your hands. Hold fast to Jesus; bare your heart to him; and keep going.